After the proposal to demolish and redevelop the historic Spitalfields Fruit & Wool Exchange was rejected unanimously twice by the members of Tower Hamlets Council, last night the Mayor of London, Boris Johnson, overruled them and gave the plan his blessing. Now, the sixty small businesses based there have to move out by the end of November to make way for the corporate office block that will take the place of the current building. Today I am republishing this account of my visit to the Exchange earlier this year. Opening in 1929, when the volume of imported produce coming through the docks more than doubled in the ten years after the First World War, the mighty Fruit & Wool Exchange in Spitalfields was created to maintain London’s pre-eminence as a global distribution centre. The classical stone facade, closely resembling the design of Nicholas Hawksmoor’s Christ Church nearby, established it as a temple dedicated to fresh produce as fruits that were once unfamiliar, and fruits that were out of season, became available for the first time to the British people. After sixty years as a teeming warren of brokers and distributors, the building languished when the Fruit & Vegetable Market moved out from Spitalfields in 1991 and there were no wholesalers left to cross Brushfield St and supplement their supplies of British produce from the auctions at the Exchange. Since then, around sixty small businesses operated peaceably from the building which through its shabby grandeur reminded every visitor that it had once seen better days. Yet it was only a matter of time before the notion of redevelopment arose, and when ambitious plans were revealed over a year ago for a huge new building to replace both the Exchange and the multi-storey car park behind it – filling two entire blocks – a sense of disquiet was generated in Spitalfields, especially among those who remembered the uneasy compromises entailed in the rebuilding of the Market. Few have been convinced by the homogeneous box that was proposed to stand in place of the Exchange and many were disappointed when the creators of such mediocrity dismissed the current structure as of negligible architectural worth. In fact, the Commercial St end of the Exchange building closely matched the window structure and red brick of the eighteenth century houses in Fournier St, while the facade mirrored Christ Church itself. Since then, a revised proposal has been forthcoming which retains the Brushfield St frontage facing the Spitalfields Market but is far from being a design worthy to face Nicholas Hawksmoor’s masterpiece of English Baroque upon the opposite side of Commercial St.
And so, before it vanishes forever, I went over to take a look around and savour the past glories of the City of London Fruit & Wool Exchange for the last time. Ascending from the grand entrance, a double staircase worthy of a ballroom in a liner or fancy hotel leads you up to the auction rooms. 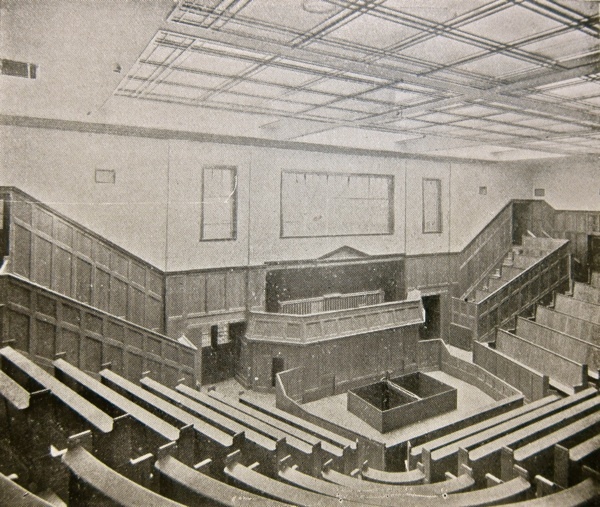 Built as the largest in the country, seating nearly nine hundred people, these magnificent panelled chambers were each the height of two storeys within the building. Fitted with microphones, which were an extraordinary innovation in 1929, possessing elaborate glass roofs that promised to simulate daylight – even on dark and foggy days – to best illuminate the fruit, they were served by high-speed hydraulic lifts to whisk samples of each consignment from the basement in the blink of an eye. Too bad that a recent fire, occurring since the redevelopment was announced, meant they could never be visited again. Now the entrances to the most significant spaces which define this edifice are sealed with tape and off-limits for ever, while charred parquet flooring evidences the flames that crept out under the door. Instead, I had to satisfy myself with a stroll around the empty top floor through centrally-heated corridors maintained at a comfortable temperature ever since the offices were all vacated two years ago. 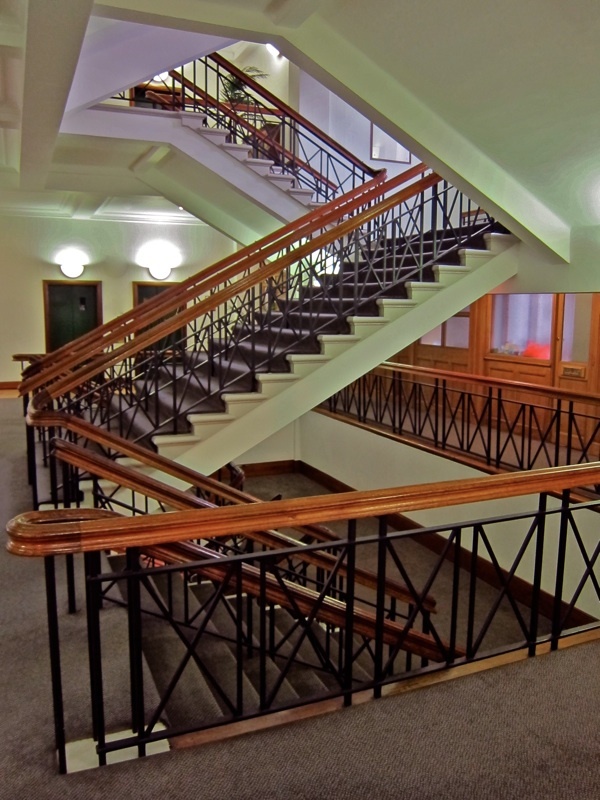 Everywhere I could see evidence of the quality of this building, from the parquet floors which extend through each storey, to the well-detailed brass fixtures and high-quality Crittall window frames that were still in good order. Within the building, hidden light-wells permit glass-ceilings to be illuminated by daylight upon each storey. Peering into these spaces reveals the paradoxical nature of this edifice which presents ne0-classicism to the street but adopts a vigorous industrial-modernism within, employing vast geometric shaped concrete girders to support the roof spans of the auction rooms below and arranging rows of narrow metal windows in close grids that evoke Bauhaus design. From the top, I descended through floors of long windowless corridors lined with doors, where an institutional atmosphere prevailed, hushing the speech of those stepping outside their offices as they enter these strange intermediary spaces that belong to no-one any more. My special curiosity was to explore the basement which served as a refuge for the residents of Spitalfields during the Blitz. It was here that Mickey Davies, an East End optician known as “Mickey the Midget,” became a popular hero through his work in improving the quality of this shelter. It had gained the reputation as the worst in London, but later acquired the name “Mickey’s Shelter” in acknowledgment of his good work. 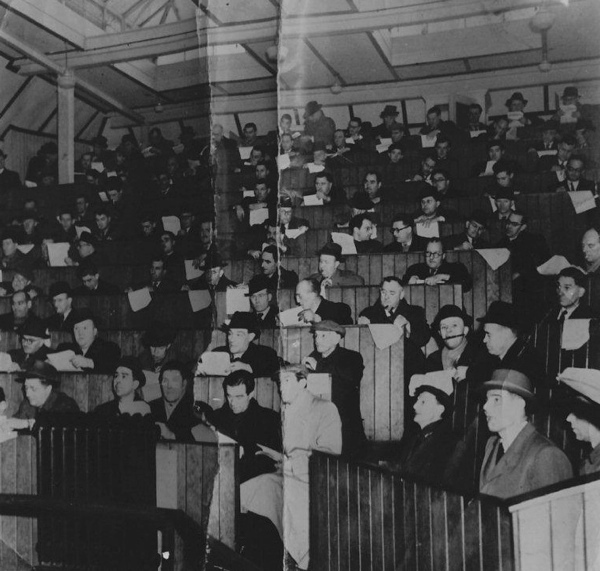 As a shelter marshall, Mickey witnessed the overcrowding and insalubrious conditions when ten thousand people turned up at this basement which had a maximum capacity of five thousand. He organised medical care and recruited volunteers to undertake cleaning rotas. And, thanks to his initiative, beds and toilets were installed, and even musical entertainment arranged. 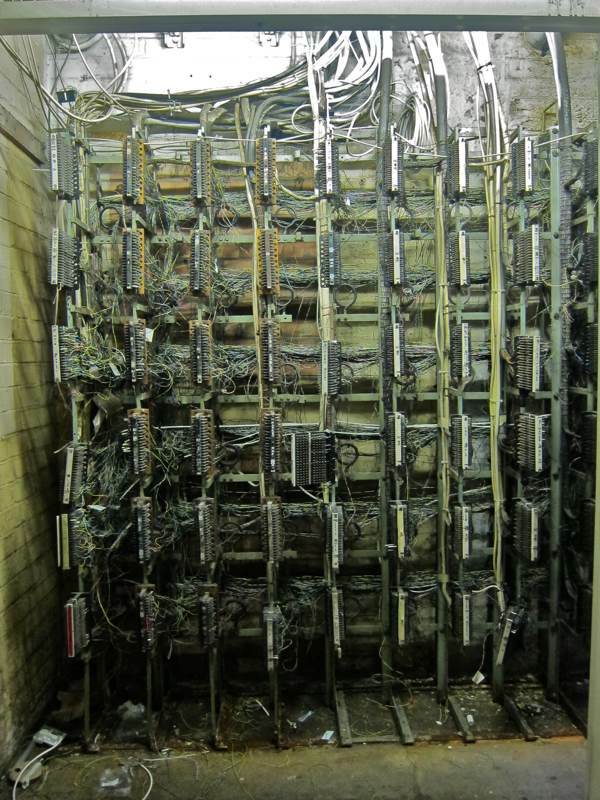 The vast subterranean network of chambers has been empty for twenty years now – gloomy, neglected and scattered with piles of broken furniture. Although partitions have been fitted to create storage rooms – where, mysteriously, Rupert Murdoch recently installed his archive – the Commercial St end of the building remains open and forlorn, with concrete pillars adorned by graffiti. Fruit packers marked off batches of produce in pencil on the wall here, and amused themselves by writing their names and making clumsy doodles. 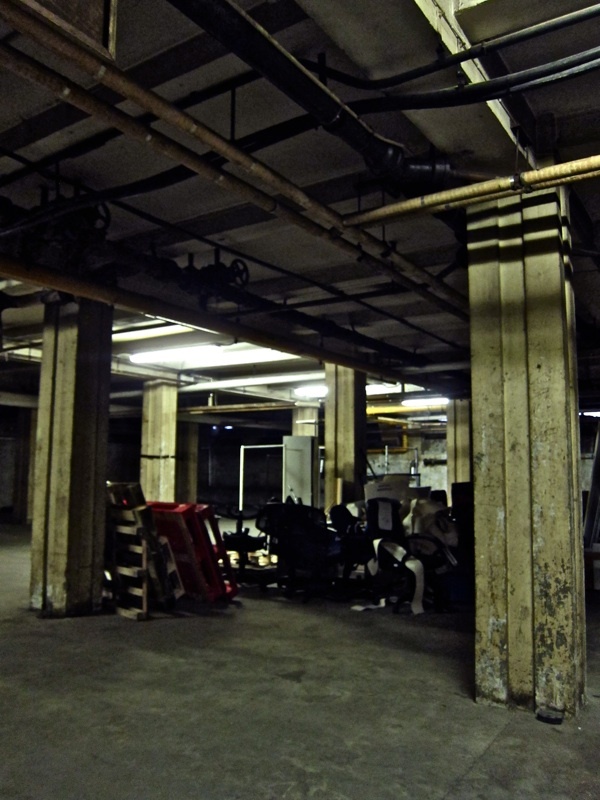 In this lost basement, it is still possible to imagine the world of Mickey Davies, where thousands once slept upon the floor while the city burned outside. 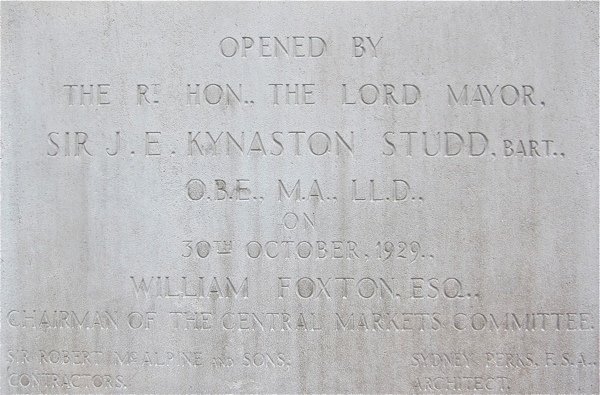 From Brushfields St, the City of London Fruit & Wool Exchange appears implacable – yet I discovered it contains a significant part of the hidden history of Spitalfields that will shortly be erased, to leave just an empty facade. The central staircase, worthy of a ballroom in a liner or grand hotel. 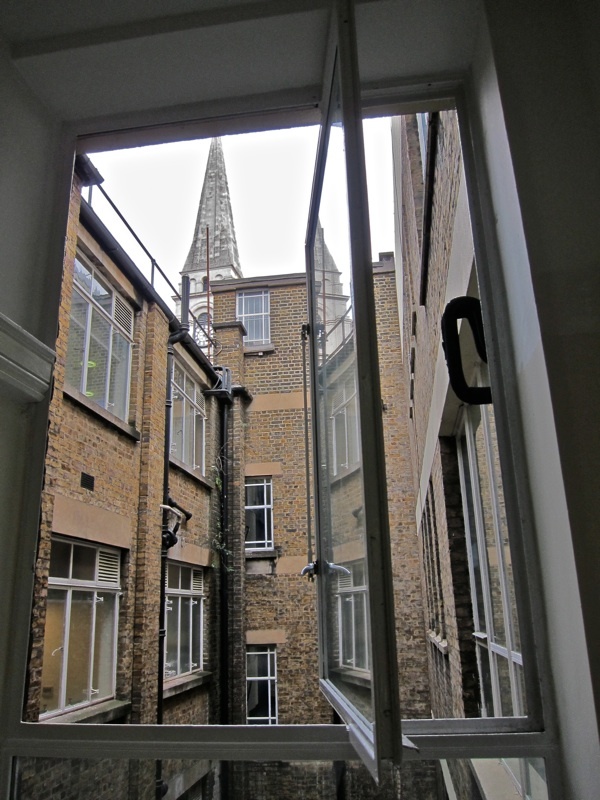 One of several light wells, lined with Crittall windows and permitting daylight to reach lower storeys. Looking out towards Crispin St from the rear of The Gun. Washing room in the basement. As many as ten thousand people slept here every night while taking shelter from the London Blitz. 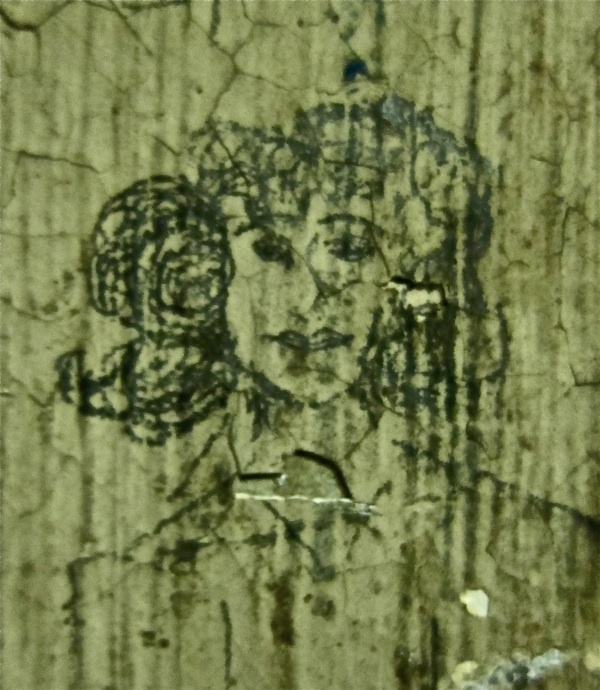 Nineteen forties graffiti portrait from the basement. State of art auction room in 1929, lit by a glass ceiling offering “artificial daylight” on foggy days. 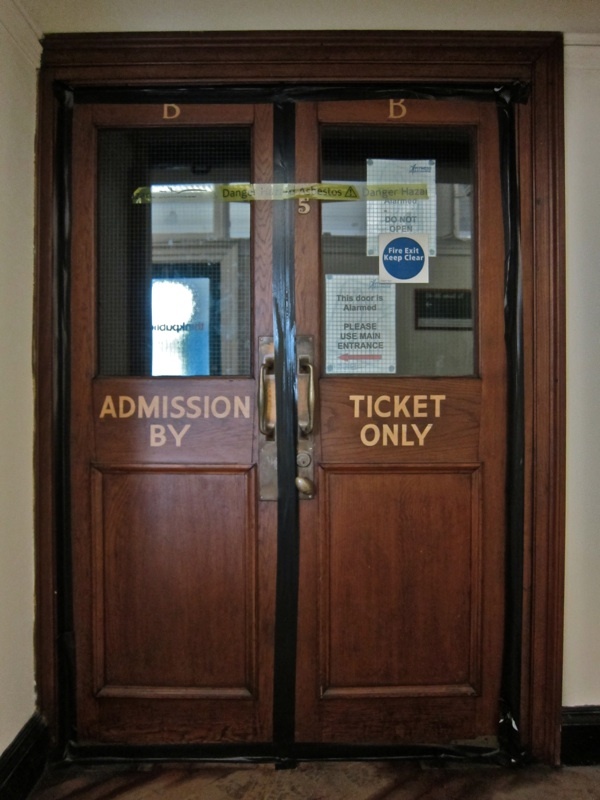 An entrance to the Auction Hall, now sealed permanently after a recent fire. The broken pediment at the top of this frontage mirrors Nicholas Hawksmoor’s design of Christ Church. 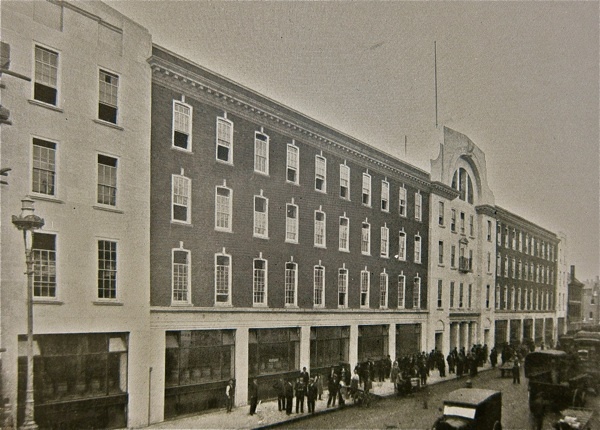 The Exchange in 1929. It is proposed that only this frontage be retained in the redevelopment. View of Christ Church from the top floor. Blast Boris. I follow you from afar in earthquake shattered Christchurch, New Zealand and love seeing all the wonderful old buildings still intact and used or with potential for use. This is sad – what a slice of history served into the corporates maw. A beautiful building, entirely comfortable in its surroundings and with form following function, to be demolished for yet another glass box of arrogance. I wonder when people will wake up to the true nature of Boris Johnson? Probably when banners are flying and the jackboots marching again. A truly sad and disappointing demolishing of the past. This is appalling and beyond belief that Boris is legally entitled to over-rule the local council and the local people. So what will be in its place – another soulless glass monstrosity as the City creeps ever eastwards? What an amazing building! And what small-mindedness on the part of the developers and the Mayor! It shouldn’t shock or surprise me, but it always does..
What gives Boris the power to overrule it? Why does he care enough to give his time to it? How terrible that this lovely building is going to be demolished. 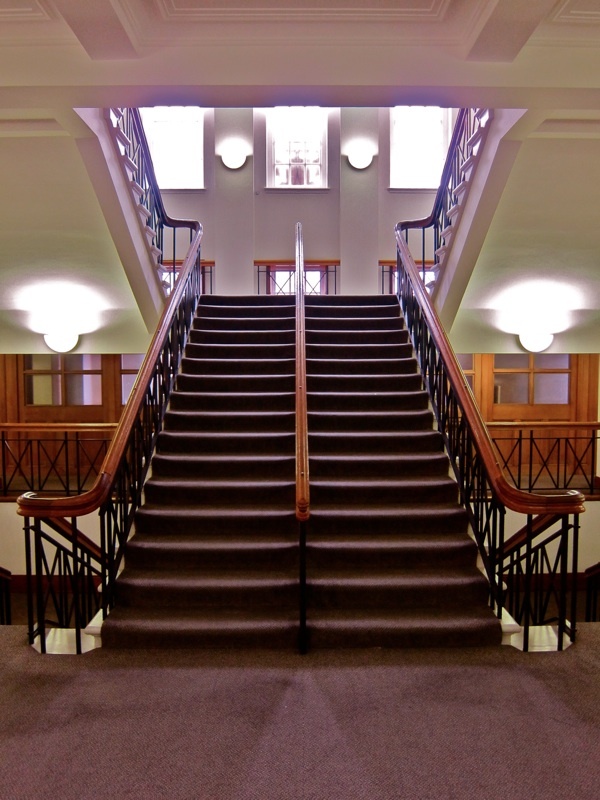 The thought of them ripping out the beautiful central staircase really saddens me. Shame on you Boris. This beautiful building deserves to remain. So sad, Boris Johnson should hang his head in shame! To bulldoze this lovely old building and build another modern monstrosity in its place is nothing less than criminal. A very sad day for what’s left of Spitalfields. Shocking! Tower Hamlets voted unanimously agains demolition – but the Mayor can overrule this. I thought we lived in a democracy. But then, of course, a very large amount of money was on offer, counting for more than anything else. The campaign to save it was magnificent, they couldn’t possibly have done anything more, a huge thank you must go to them. That’s so sad, it’s a beautiful building and I’m sure a far nicer environment to work that another soulless box. How can one man overrule a decision by local council like that, it maddens me. Commerce and so-called development win out over quality once again – very sad. This is utterly dreadful – another case of a rich, powerful and influential person trampling over others with no thought for the consequences – Boris Johnson should be ashamed of himself! We move on, an old building retains it outward facade but gets a modern useable space for modern business. The companies inside always knew that the building was to be redeveloped, thats how we got low rents to launch our businesses in the first place. We now spread further into the East End, Dalston, Shoreditch, Hoxton and Whitechapel now benefit. Fantastic. It is just a pity Examplar didn’t put the saved facade in the first instance as what they offered at the start was truly horrible and did much to rightly annoy everyone. However the nit picking about losing Dorset street and the anti big business aspect of much of the campaign was real them and us stuff. Dorset Road has been a service access road since 1929! WPP is moving into the area drawing in other major media groups. The financial business (whose name escapes me for the moment) has been based locally in Fashion Street supporting the mirad of local business. They have outgrown their old base and need more space. Wonderful! The East End moves on as it always does, the best architecture kept (but not always I grant you), commercial interest satisfied and we, the residents and local business owners get another important business setting up in our backyard. Another important piece of history to disappear, thanks to the ghastly Boris. That Boris is a (insert whatever comes to mind here). To favour a corporate office block and kick out small businesses confirms what he values most. I wonder if he received any corporate kick backs as well. I don’t comprehend how a building like this can be demolished. Here where I live, the ugliest shopfronts, that date back to slums of Sydney (truly hideous looking buildings) are heritage listed. This exchange, in comparison, is a palace and it’s getting demolished? This is London – not Hong Kong. The garish shard is bad enough. Boris should not be destroying the reasons I love to visit London. If he turns it into high rise hell I won’t want to visit in the future. I live in Canada and have averaged two visits per year over the past twenty years. The city stretches and yawns and hungers and eats. Bit by bit everything of a different scale or personality is sacrifriced to feeding it because it might create jobs? It doesn’ create jobs. It just moves them around the city, like it did at Canary Wharf, but maybe a few Bangaldeshi people here will get posts as low paid cleaners. There’s no them and us? What about the ‘them’ that can overide the decison of all parties on the local council and the ‘Us’ who can’t do a thing about it? A facade kept on the front of a new building is a bigger insult, as if the value of a building is just on the outside. What a disappointment it will be to walk through the promising door of the Fruit and Wool Exchange into a space with the history ripped out. I bet the developers use the history of the building as a big selling point – “have a new office in the former Fruit and Wool Exchange”! In our town we’ve just managed to hold off the pulling down of the old brewery and a row of Georgian cottages to flatten into a car park for a new supermarket – but it still might happen with the promise of keeping the facade of the archway! I have a book from the 50′s about town planning – pulling down a 17th century buidlings for a Woolworths etc and it’s strange how it’s still happening. I am dismayed by this – the building is a sound one and well used. It is a total waste of resources to destroy 90% of it – apart from the damage to small businesses. 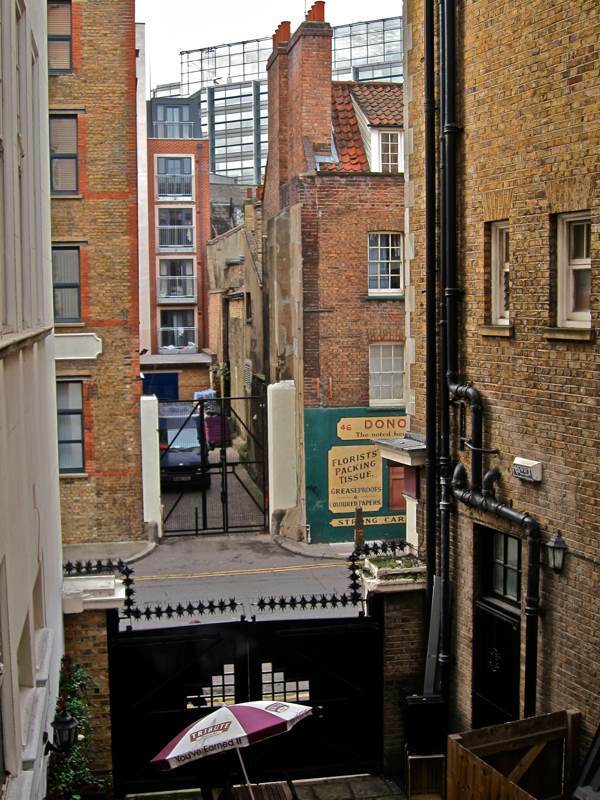 One hoped that the City’s invasion of Spitalfields could have been stopped here – what a misuse of the Mayor’s powers. I don’t know that much about London’s municipal structure, being a Canadian, but can the mayor on his own actually overrule the local council? This sounds very bad. Shame on Boris Johnson. So much for his apparent interest in history and democracy. We all should be ashamed that we can still be ruled by … (use your own words). And so he proves himself to be even more rubbish than before. This building has a poignant meaning for me, I was walking past it in 1993 on Saturday morning when the Bishopsgate bomb went off……and it did not fall on me or shatter me with glass. Other buildings in the area were less fortunate and the devastation was all too apparent. Mr Wheeler is incorrect. Dorset Street was not a “service access road” from 1929. It was a street, laid out 1672 with houses – on both sides. The houses and businesses on the south side were not demolished until 1963. If it was a service access road how could there have been houses and businesses there? The Corporation bought the householders and businesses out from 1960 onwards to demolish that side and down to White’s Row for a car park. Also don’t know why you think the single “important business” responsible for displacing 61 small businesses should be welcome in our backyard. It may bring benefits to you, but that is not the majority feeling. And why don’t they move into the existing business space of 21,000 sq. m.? Perhaps because it is the City traders ICAP plc and they require trading floors – hence demolition of heritage that belongs to all of Tower Hamlets? Besides killing off Spitalfields Market. Thank goodness most of the real tenants of the 61 small businesses of the Exchange are not like you – just a shame you all have notices to quit for this one important financial business and while you are selflessly cherishing yours, they are desperately unhappy. There are also many, many other real small businesses in this area who will be devastated by this office block for ICAP plc – and residents who won’t be making anything out of the City suits. I watched most of it. Although the mayor said it was a difficult issue, it seemed obvious to me that he had already made up his mind beforehand. 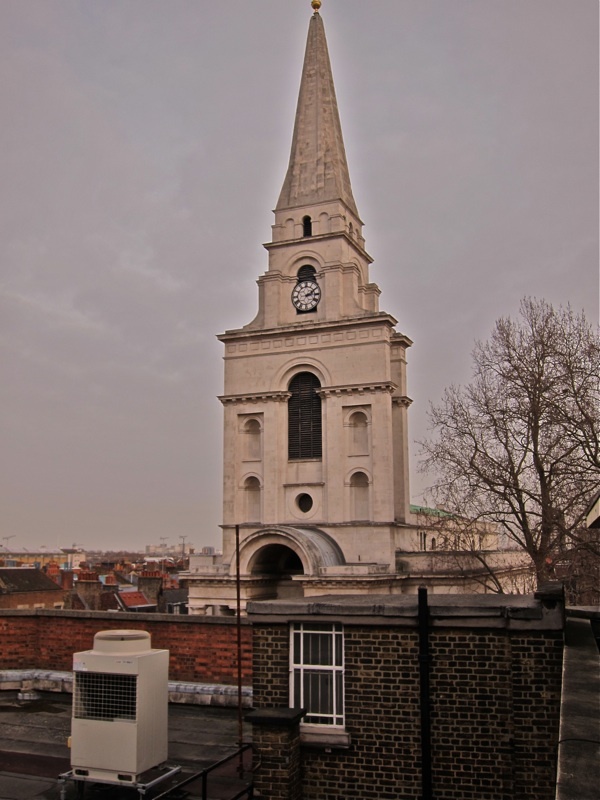 Interesting to note who some of the supporters of this development were–the rector of Christ Church Spitalfields, for example, and architect Chris Dyson. The real trouble with such schemes is that they seem to be all-or-nothing. Keeping “The Gun” & the F&W Exchange, and knocking down the rest (especially the m-s car park!) would have been an ideal option, but it didn’t seem to be on offer. Also, is it, even now, not too late to LIST the L F & W Exch. ?? Would that force a re-start? What a shame, a crime against Architecture. This arrogant and autocratic overruling of the Council’s decision and the wishes of the residents, although legal, runs completely contrary to the government’s avowed policy of localism in planning matters. Does anyone know it the excahnge is listed ( I asked this above)? If not, could it be listed, as this would then require a fresh enquiry, to at least stall the developers, and maybe get a better scheme…. There are a lot of listed buildings in the Fournier St & Spitalfields area, generally. Is the “gentle author” aware of the photographic register of listed buildings of England, organised a few years back by the RPS? Though the ones I took in Folgate & Fournier Streets are not so bad. It is definitely not too late to List the Exchange – SAVE Britain’s Heritage are trying to do it. It was announced at the Hearing. If you watch the Hearing webcast (@ Andrea has put a link above), you will see the first announcement quite early on. It was also brought up again later. Their Press Release there is not working, but it has been fixed for the Save the LFWE (1929) Facebook page where you can also help by lobbying the Secretary of State and English Heritage to make this Listing happen. Hope you will get involved – and anyone else reading this as Listing the building is the only thing that will stop the demolition. Andrea – the Rector of Christ Church will get money for his crypt restoration from the developers if the demolition goes ahead. It all comes down to the money. Shame! This is a disgraceful decision by Boris Johnson. Will the grand staircase survive? 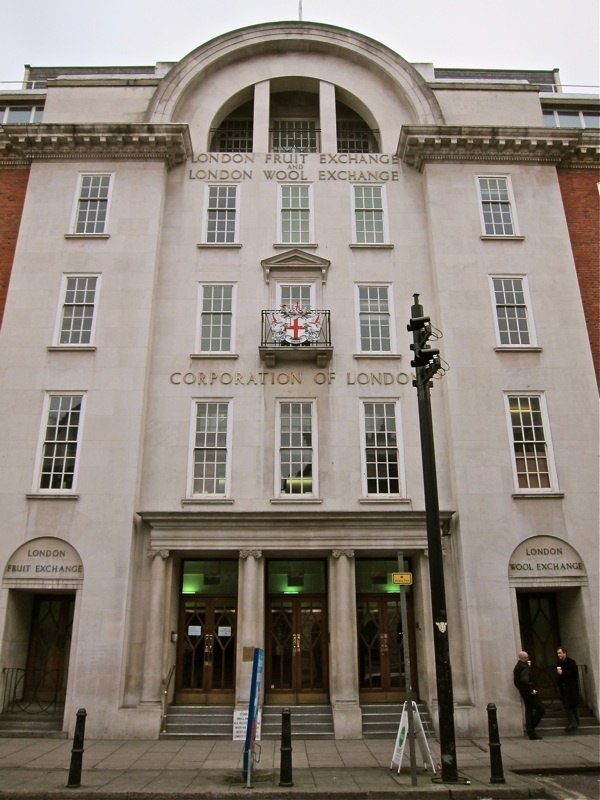 For some years I have visited the London Fruit and Wool building as my daughter’s company have had their office there in different parts of the building. It is beyond my comprehension that such a building should be demolished – new is not always better. The staircase is wonderful, the facade (which I believe is to be preserved) is wonderful. Shame on Boris and his cohorts for even contemplating it’s demolition, never mind endorsing it. Update and good news ! 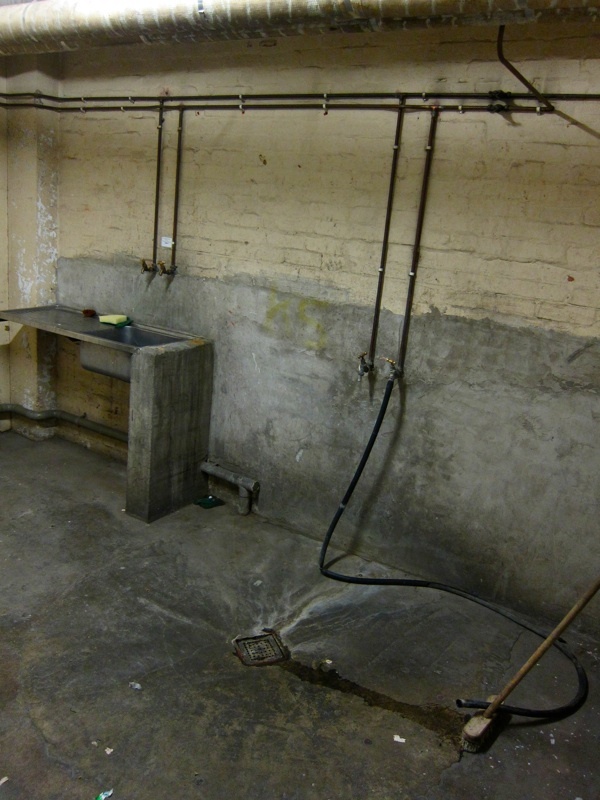 Thanks to SAVE Britain’s Heritage’s application for Listing for the Exchange, English Heritage have completed their initial assessment which considered the Exchange’s ‘special architectural or historic interest.’ This included Mickey’s Shelter, in the basement – London’s largest WW2 air raid shelter. EH’s Consultation Report was issued to the relevant parties: SAVE, Tower Hamlets and the building owners for a Consultation ending on 31 January. After this English Heritage will make a recommendation to the Secretary of State for Culture, Media and Sport. We just have to hope it is a recommendation for Listing. Please keep your lobbying going. “It will create jobs” For Spitalfields? I doubt it. I’ve often wondered why London can’t offer sites which are generally considered expendable. Instead, It lets developers creep in through the backdoor like sneaky intruders, thereby arousing deep local resentment. Further, as a lifelong conservative, I hope Boris Johnson never appears on my voting papers. Boris Johnson is an idiot! Fingers crossed for the Listing Process. Is there anything further we can do to lobby? This is so depressing, losing such a characterful building. Belated answers for Tony and Dee. Tony – nothing would survive of the interior (including the central staircase.) The ‘facade’ proposed would be the only surviving remnant after demolition, and that would be fake with dummy upstairs windows and the ground floor entrances, stairs and windows gutted. This butchered sham front would sit alone on Brushfield Street, 4 metres in front of a new development. Dee – English Heritage have now recommended to the DCMS that they do not list the LFWE. Mickey’s Shelter does not have enough ‘social significance’ to merit listing in their opinion! But we can go on lobbying as it is down to Maria Miller, the Secretary of State for Culture, Media and Sport to decide. SAVE Britain’s Heritage are now appealing to Ms Miller to do the same as happened at Covent Garden when, against similar advice, those Market buildings were listed. Dear GA, SAVE have just issued a press release. Could you help to publicise this last chance for the LFWE and Mickey’s Shelter, and also for all reading this, please do what you can? Try and get the news of this DCMS appeal into the press. Also, lobby your MP’s and if in Tower Hamlets, ask your councillors and Mayor, what they will do. Thank you all, especially GA, for showing people everywhere what a beautiful building with an extraordinary history we have, and for all the campaigning for our built heritage. SAVE were involved in helping stop the demolition of the Marquis of Lansdowne. They couldn’t stop the demolition of ‘Mother Levy’s', the 1911 Jewish Maternity Hospital in Tower Hamlets. They stepped in after Boris Johnson called-in the demolition refusal (to overturn it) and they applied for Listing for Spitalfields Market’s 1929 Exchange. We must support them to the end. There is no excuse for demolishing this fine old building. It is sad that most architects only seem to be able to think in terms of repetitive contemporary design. They display zero imagination where their skills ought to be able to conceive of a design that allows a modern business to work but also retain the essential structure of the building. I refuse to believe that it could not be done if people wanted it. Remember, once these old buildings are gone, there is no bringing them back. The Mayor is warranting the destruction of our history because the developer Exemplar are paying him off with £2,000,000 for Crossrail. I have contacted English Heritage, if we all do the same we can force more of this building to be preserved. This part of British History should not be demolished – they want more money and they already have too much!! Fab building. How can this city be do bonkers as to risk the loss of such a stunning building. Sadly Boris always has the same answer to the developers. ……..Yes. He should grow some. Sadly I voted for him. Should add that English Heritage are pretty useless on the whole…….so do not expect much! I worked in the basement of this building in 1967/68 repainting the traders signs from Spitalfields. We took them down and round to the back of the building, down the stairs to the basement to repaint them and sign write them. It was a bit quiet working down there on my own. doesn’t time fly. Well at least we can now be sure exactly whose side Boris is on, and it’s not ours! He’s in the pockets of big business, and has no concern whatsoever for ordinary Londoners. I’m just back from a holiday in London and visited Brushfield Street. I guess it won’t be quite the same next time, with ‘The Gun’ gone to make way for yet more of the acres of glass that makes London look like any other city. Greetings from Canada, where we continue to also tear down historically significant buildings, or close them (museums) thanks to the government. This is awful. I used the gym there and loved going for a snoop about the building. There is nothing left now – just big glass boxes. In wapping, I have been watching the character being demolished and container style flats put up. There is very little left now – even Red Lion Street/Square has been allowed to decay to the point the developers can put through their plans. It is heartbreaking. I am all for progress, but this really doesn’t feel like it. I despise Boris Johnson, what an ugly and short sighted fool he is. How can he destroy such a beautiful and historical building..shame on him. So tragic that this beautiful building is being demolished, it could have been preserved and used for many new purposes. The level of quality and craftsmanship found in buildings like these will never be seen again, no matter how much is spent on a new building to replace it. Its classic timeless beauty is lost to us forever and the new building will be made from vastly inferior materials and will probably look dated within a decade. I used to work for White and son in the early 70′s very much as an office junior. They were independent brokers in the building and I was allowed in during school holidays. Best job of my life and I fell n love with the telephonist evry time I saw here but doubt she felt the same way. In belated reply to Mark Wheeler, had you ever actually been in the London Fruit Exchange you would be fully aware that not only was the building of great architectural merit but also up until it’s demolition was still sturdy and fit for purpose, housing 60 businesses who had to move out to make way for the modernisers to come in with their tatty building materials and designs. The LFE was not falling down, it was only 85 years old, one of London’s newer landmarks. To leave the edifice is at least something, but it was the building as a whole, inside and out, that made it an architectural gem. Greetings to all, from an interested Yank. If I understand correctly, the historic path of Dorset Street is to be completely swallowed up by this new, expanded Exchange? 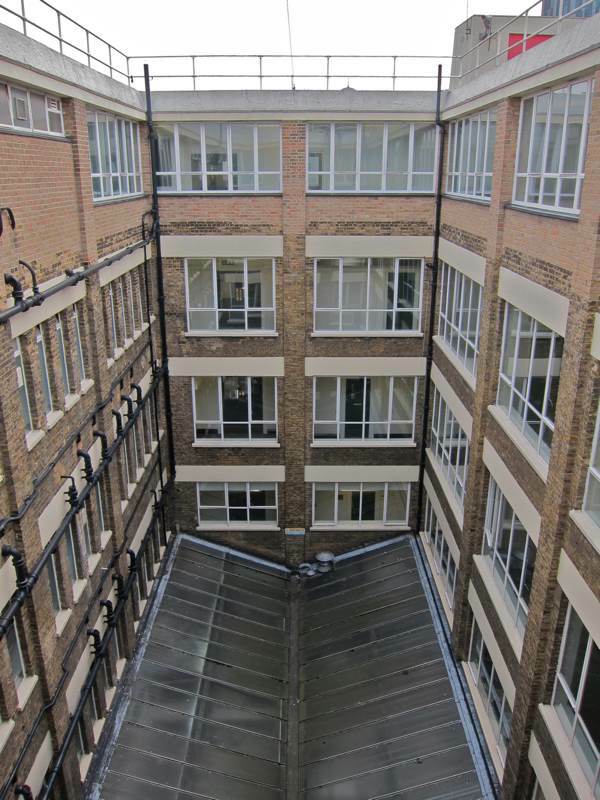 And if so, will this not place the site of one of London’s – and indeed, history’s – most notorious unsolved murders smack dab in the middle of the new building? A grievous loss, both from an architectural and an historical viewpoint. I have yet to be able to visit beautiful London – please don’t let them tear down all the good old stuff before I get there! 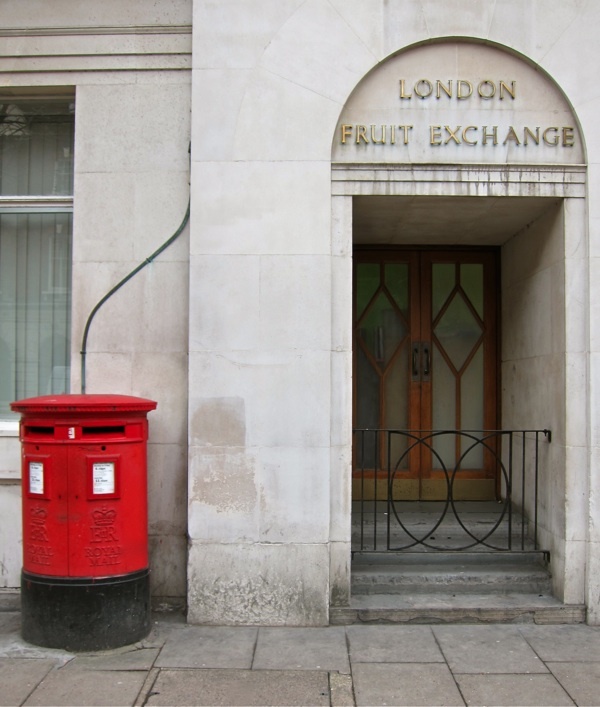 My first job was working in the London Fruit Exchange in 1950 for J.C.Houghton and Company Ltd. My father was a Director and the Auctioneer and I still have my Brokers official badge. I left in 1955 to go into the Lloyd’s insurance market where by coincidence I worked with Mike Corby who turned the LFE auction rooms into squash courts in the 1970′s I think. If anyone wishes to contact me -please do so.